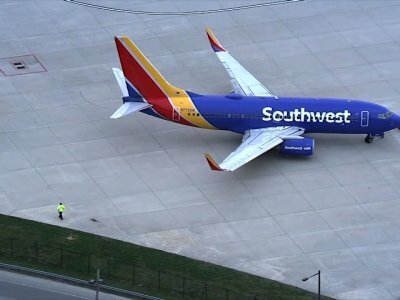 PHILADELPHIA (AP) — A Southwest Airlines jet with a damaged engine and broken window made an emergency landing at Philadelphia’s airport Tuesday, and one passenger was critically injured. A former federal investigator theorized the plane blew an engine and the shrapnel hit the aircraft. Seven other people aboard the Boeing 737 that was headed from New York’s LaGuardia Airport to Dallas’ Love Field were treated for minor injuries, according to Philadelphia Fire Commissioner Adam Thiel. He said there was a fuel leak in one of the engines when firefighters arrived and a small fire was quickly brought under control. The Federal Aviation Administration said that the plane landed after the crew reported damage to one of the engines, along with the fuselage and at least one window. They didn’t immediately explain what went wrong. The National Transportation Safety Board sent investigators to the airport. Bourman said she saw emergency medical workers using a defibrillator to help a woman who was taken off the plane. Thiel declined to release any other details about the woman’s condition. Tracking data from FlightAware.com shows Flight 1380 was heading west over New York’s southern tier at about 32,200 feet (10 km) traveling 500 mph (800 kph) when it abruptly turned toward Philadelphia. Investigators with the National Transportation Safety Board said one of the engine’s fan blades broke off from the hub during the flight. The broken edge of the blade showed crack lines consistent with metal fatigue.